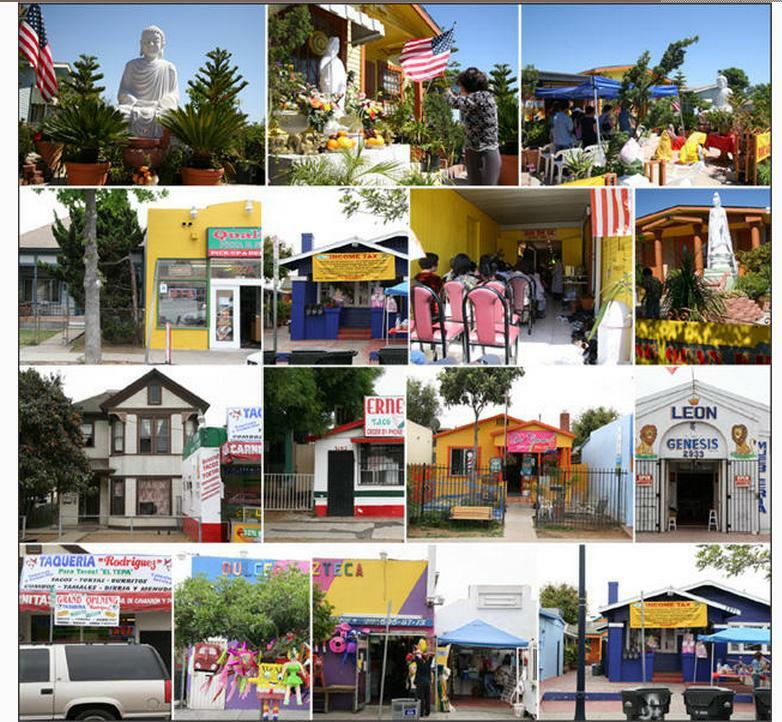 Elements of Latino New Urbanism in San Ysidro, Calif. emphasize vibrant public spaces and community gatherings. Photo by Teddy Cruz. This case study is a continuation of our “Cities in Flux” post about Latino New Urbanism, a way of understanding community, public spaces and neighborhoods by acknowledging the preferences and culture of Latino immigrants. They are places that are layered and altered from the ground up, as opposed to being single-use and organized. James Rojas, an urban transportation planner, describes “Latino New Urbanism” as the sort of place that “derives its character” not from “structures, codes and designs” but from the way Latinos have transformed and adapted American suburban or urban environments to fit the needs of their communities. Teddy Cruz, a San Diego-based architect, has also been influenced by the principles of Latino New Urbanism and his experience in Latin America, including border towns like Tijuana, Mexico. Cruz’s plans, and the organizations and residents he works with, aim to create places influenced by informal uses and ground-up control. They include elements like shared space, easy access to public transit, varied pedestrian uses and opportunities for retail and mixed-use spaces centered around plazas. The living units Cruz has designed often accommodate older and younger generations. Cruz’s methodology of design and implementation is inclusive and utilizes concepts of smart growth and transit-oriented development. “We need to rethink the way we’ve been developing, and what we mean when we talk about housing, density, community, and neighborhood,” he says. His other project in California, in the border town of San Ysidro, called “Mi Pueblo – San Ysidro Pilot Village,” will likely begin construction this summer. Cruz, along with the grassroots non-profit Casa Familiar, helped to design a 12-unit housing development in San Ysidro, 20 miles south of San Diego. It consists of two parts: “Living Rooms at the Border” and “Senior Housing with Childcare.” (You can view multimedia information on the project at the Museum of Modern Art (MoMA) website). Casa Familiar has also been working to develop plans that “address the community that’s there,” which is 95 percent Latino, says David Flores, a staff architect at Casa Familiar, which acts as an “alternative developer of affordable housing.” His work San Ysidro entails broader changes in the planning codes implemented by the City of San Diego. “We’ve pushed the edge of what municipalities consider mixed use,” Flores says. The San Ysidro plan includes uses not typical of California, a state where urban planning often consists of single-use and and one-floor developments. 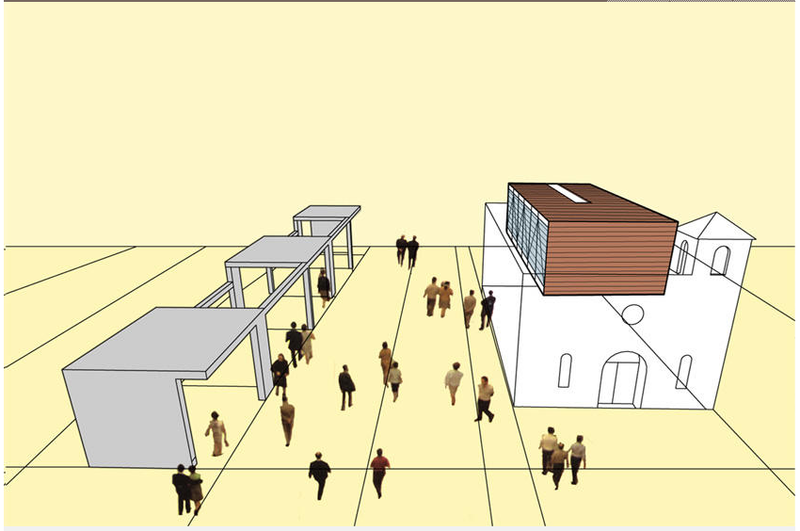 “Mi Pueblo” includes space for art, retail and outdoor recreation that will allow for informal retail, like seasonal food stands, or social service providers located close to housing. The design of "Living Rooms at the Border" includes mixed-use development with a rehabilitated church and affordable rental housing. Image by Teddy Cruz. The border city houses about 32,000 residents where the median household income is around $22,000 year. The development Cruz helped design centers around an open corridor that acts as a shared, communal space—informal and flexible. Pedestrian pathways connect residential areas to key places like a new library and recreation area. A row of housing units “is conceived as a series of interlocking rooms that can be broken down into two one-bedroom units or pieced together for large families. ” This is just one piece of the development, which also includes housing for seniors complete with a full-time day care center, since in many Latino families, immigrant children are raised by their grandparents. Additionally, existing alleyways will be extended to improve mobility among sections of the neighborhood, interconnecting parts of the community. As GOOD Magazine says, residents can participate in “sweat equity,” where they work on construction of a housing development to gain credits towards rent on future homes. Casa Familiar’s work is meant to mobilize social entrepreneurship and ultimately meet the actual needs of residents in the area. As part of the organization’s efforts, the city has adopted a new strategic element called “city villages,” Flores says. This means that more focus will be on the existing community centers that make up the city of San Diego, and efforts will include “upzoning,” a change in the zoning classification of a property from one of lower use to one that is of higher use, for example, a change from single-use residential to mixed-use commercial.